There are a cluster of music streaming services in our daily life. However, which one is the best? Different people have different views and listening habits. Here we share the main features of 3 popular on-demand music-streaming services ( Apple Music, Spotify and Tidal ) used before. You can choose one that meets your tastes and requirements. 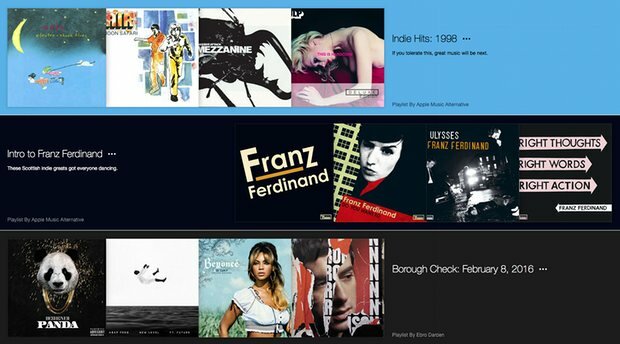 Recently, Amazon also launched its own music streaming service – Amazon Music Unlimited, users have one more choose from. If you want know more about Amazon Music Unlimited, you can visit here. Apple Music launched with great expectations in the summer of 2015, the number of paying subscribers on Apple Music already exceeded 15 million six months after its launch, a very good result. There is also something new added to Apple Music to change the music experience of users. What makes Apple Music different from other music subscription services. Beats1: Beats 1 is a radio offering, which features an around-the-clock worldwide live broadcast from DJs based in Los Angeles, New York, and London. It promises to deliver a curated selection of songs, pop culture news, and interviews with artists. Apple Connect: Connect is Apple Music’s artist-based social networking feature, in which fans can follow their favorite artists. Artists can share their special content with fans through Connect—hip-hop artist Drake took the stage at WWDC to show off how he’d use Connect to post behind-the-scenes photos of his life, share snippets of new songs, and other content. Besides Drake, you’ll find Connect profiles for Pharrell Williams, FKA twigs, Alabama Shakes, Pearl Jam, and more. Apple has also created genre-specific profiles to follow. For You: As for curation, Apple Music also provides recommendations tailored according to your tastes, looking at artists you like and serving up other artists and playlists for you to listen to. But instead of being built by algorithms, they are built by real people. You can find these in the “For You” section of the app—but first you’ll have to set it up by following the prompts to select genres and artists you like. Verdict: For heavy iTunes users firmly embedded in Apple’s ecosystem, it’s made a good start. Due to DRM protection, there are limitations to enjoy Apple Music freely, for example, the songs we downloaded are not accessible after canceling subscription. We also can not play Apple Music Songs on MP3 player or other portable devices. NoteBurner iTunes DRM Audio Converter could help you get rid of the restriction in 3 steps. Spotify was opened in September 2008 by Swedish startup Spotify AB. On June 2016, Spotify had more than 100 million active users and about half a billion registered users. The number of paid subscribers reached 30 million in March 2016. Spotify has two ways for listening, Free and Premium. The Free plan uses advertisements that play between songs to cover costs. 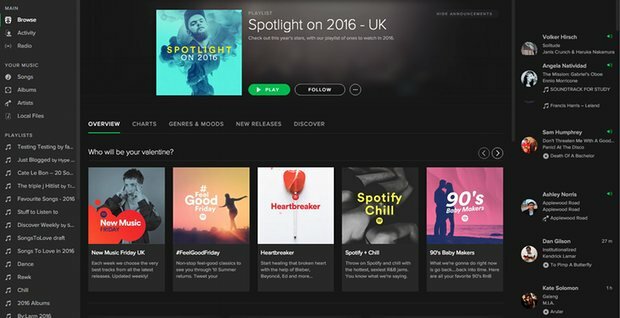 Premium is Spotify's flagship product, full of the eye-catching features. It costs $9.99 per month and no ads to be found. Playlist: Spotify has a wide range that are updated with new songs every week, but it also has a deep catalogue of playlists created by outsiders: labels, media, musicians and fans. Follow a few, and you’ll have a regular supply of new tunes. Every Spotify user gets their own Discover Weekly playlist too, updated every Monday with 30 new songs that its recommendation algorithms think you’ll like, based on your own tastes and those of people like you. Social Features: Spotify has better social features than its rivals, with the ability to add friends and see their playlists and listening, as well as a built-in messaging system to ping music back and forth. Creating and sharing your own playlists is easy too. 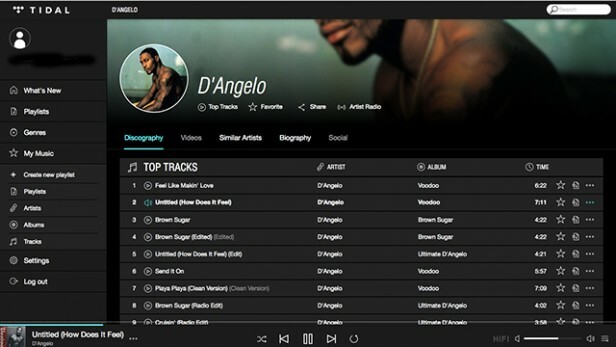 Verdict: Some new features were added at a rapid pace to discovery more music. Its flawless implementation and integration into the general experience has made things a lot better. If you are a long-time user of Spotify, you may want to download music on Spotify as MP3 format to enjoy these lossless audios at any moment and any place. You can try Spotify Music Converter. Tidal is a subscription-based music streaming service that combines lossless audio and high definition music videos with curated editorial. This service has over 25 million tracks and 85,000 music videos. Until now, Tidal offers two digital music streaming services: Tidal Premium (lossy quality) and Tidal HiFi (lossless CD quality - FLAC-based 16-Bit/44.1 kHz). Tidal costs $19.99 for the CD quality service when it launched on 2014. But now the service operates a two-tier system. “Tidal Premium” costs 9.99$ per month and offers music at the same bitrate - 320kbps. To get the "lossless high fidelity" sound Tidal hangs its hat on, you'll still need to shell out 19.99 a month for a "Tidal HiFi" membership. CD Quality: What Tidal really differs from other rivals is that instead of only serving up compressed music formats like MP3 and OGG – as do Spotify, Google Play Music and most of the other. Tidal provides music at CD quality. It streams music in the form of 16bit, 44.1kHz FLAC files with a bitrate of 1411kbps. Big Catalogue:Tidal already had a big catalogue of music and now with a high profile owner, it’s convinced leading record labels to bring their music to the streaming service where artists will get a larger share of the profits. It’s knocking around the 25 million mark which is around the same as Spotify and Deezer and considerably more than rival high res audio service Qobuz, which offers around 14 million tracks. Verdict: As for audiophiles who want more from their digital music, it is a good choice. Each streaming music service has its own pros and cons. As to what is the best and which one is the most practical, still depends on individual needs and tastes. For example, If you like Lady Gaga, Spotify is your choice. Apple and Taylor Swift established strategic cooperative relations, whose exclusive landing Apple Music concert was held last year. So if you are the fans of Taylor Swift, you can go Apple Music. You may download you favorite songs of Taylor Swift on Apple Music. However, all songs you downloaded from Apple Music are DRM protected, so we can not enjoy them more freely. Under this situation, NoteBurner iTunes DRM Audio Converter will help you remove DRM from Apple Music, in this way, you can keep music forever to your computer, cell phones and other portable devices even though you cancel the subscription on Apple Music. Remove DRM from protected Apple Music files and iTunes M4P music files. Convert a batch of audio files at 20X faster speed and preserve lossless quality.